About a year ago, I wrote that the Royal Oak Date ref.15300 could be more interesting than the famous Royal Oak ‘Jumbo’ Ref.15202 (click here for the article). Not long after that article, I decided to pull the trigger on Royal Oak Date. On the 24th of December 2009, I did a trade-up to the Jumbo because it crossed my path. “I have read your articles comparing the Jumbo and the 15300. First of all, congratulations on a very nice review. It was well written and very informative. In fact, your blog was one of the reason I am now in the hunt for a 15300. It is to my surprise that you have traded your 15300 to a Jumbo. I’m really curious what made you do it since you’ve made a very strong case on why the 15300 is a more interesting proposition than the Jumbo and I fully agree (and still do) to all your points. Mind you, in no way I would change my mind in getting the 15300 but I would just like to gather your thoughts on what made you decide. For me, to consider that Jumbo it would have to be a vintage one and should at least come from the 1980’s and not the current. Being a fan of new technology, the 15300 suits my character well. Again, this is a matter of personal taste and I’m looking forward to your reply. 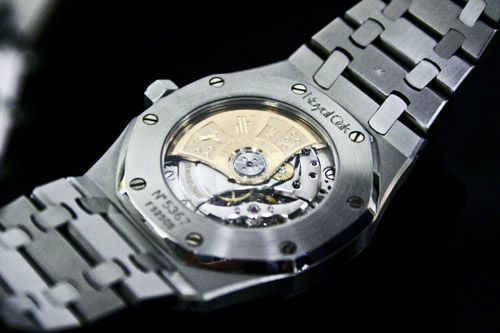 “First of all, congratulations on your decision to hunt for the AP Royal Oak 15300 time piece. You will not be disappointed. You have no idea how long I sat down in the shop of my watch dealer, comparing my 15300 with white dial to this Jumbo 15202 he had received as a trade-in for some other watch. My watch dealer is not an AP dealer and mailed me that he had this 15202 and that it was possible to do a trade with one of my other watches. There are a lot of pros for the 15300, as I wrote in my comparing review for FratelloWatches. The bracelet of the 15300 for instance, is much more up-to-date than the one on the 15202. The bracelet of the latter, makes this watch feel like wearing a vintage timepiece. The case of the 15300 is a bit higher, and therefore gives the watch a whole different look. It is more masculine and less fragile than the case of the 15202. As for optics, the 15300 is hard to beat. However, and this is something you have to experience for yourself, comparing both watches to each other while holding them in your hands. The movement of the 15202 is more interesting, even though it isn’t an in-house caliber. The construction of the rotor on a rail is making this movement incredibly flat, which enables the entire watch to be no thicker than 7,05mm. I haven’t seen a more beautiful movement when it comes to a caliber with no complications, just hours, minutes and a date. The space between the sapphire crystal and the dial is therefore so flat, that when you look at it from an 45 degrees (to almost 90 degrees) angle, it is just as if there was no sapphire crystal at all. My horological heart started ticking faster seeing the movement, and as a result of that, the amazing dial. A friend of mine says that the ratio of the dial, bezel and case is better on the 15202 than on the 15300, but I don’t agree. The 15202 does tend to look a bit larger in diameter, as the bezel is a bit smaller. Again, the up-to-date appearance of the 15300 and its price compared to the 15202 (roughly a 4000 euro price difference both new and pre-owned) makes the 15300 a very interesting timepiece that will stand out of the crowd! If you do not care for having a brand new watch that feels like a vintage watch and can’t see the added value in the caliber 2121 movement, don’t spend that extra money on a Jumbo. I was just in the opportunity to trade in my 15300 with some extra cash for a 15202 and pulled the trigger. If this deal had not come by, I would still be the happy owner of a 15300. Personally, I decided that I should hunt for a 26300 (as pictured above). 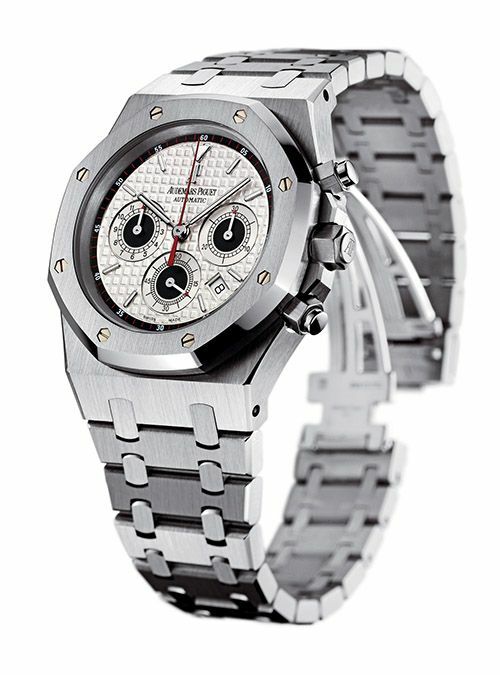 This is the Royal Oak Chronograph (no Off-shore) which has more or less the same case and bracelet as the 15300. This way, I think will have the best of both worlds. 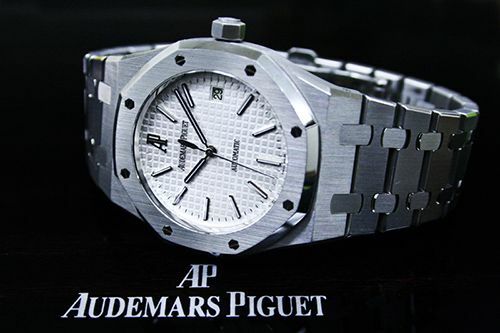 Pictures of the 15300 courtesy of Dimer, Picture of the Royal Oak Chronograph courtesy of Audemars Piguet.